Coming directly on the heels of Studio Ghibli's breakout international hit Princess Mononoke, the pressure to emulate their earlier success, as well as a collaborative production with Disney, could have spelled disaster for Ghibli and Hayao Miyazaki. Despite these risks Spirited Away winds up as one of Miyazaki's most accomplished and sheerly enjoyable films. The use of an elementary Alice-like plot device to propel the initially undistinguished protagonist Chihiro into the realm of the supernatural is the key to Spirited Away's deceptively sophisticated narrative. It's tempting to wonder how much of the film's mysteries might have been over-elaborated in the rumoured initial three-hour running time; as it is, we're with Chihiro all the way as she navigates the treacherous society of the divine bathhouse with a combination of luck, shrewdness and intuition. Despite the condemnations of contemporary superficiality and materialism characteristic of Miyazaki, there's no easy contrasting of the ordinary and supernatural domains. The Edo-era Japanese society evoked in Spirited Away is a world away from the wild premodern realm of Mononoke, yet just as savage and dangerous: violating some half-understood custom or offending a higher power runs the risk of perpetual servitude or oblivion. Keeping the action focused on the bathhouse, and making the seemingly vicious witch Yubaba a more complex and ambiguous figure than she first appears, both have the effect of provoking our curiosity about the wider world beyond; when Chihiro's ally Rin expresses her hope of one day escaping to the city across the river we itch to know what lies there. Miyazaki cannily spells out little, however, effortlessly allowing Chihiro's exploits to deliver what exposition there is. Following Mononoke once again, despite the powerful portrayals of supernatural threat and peril – Spirited Away avowedly isn't a film for very young viewers – there's no real evil to be found in the movie's world. Even the devouring spirit No-Face, one of Miyazaki's most memorably uncanny creations, only becomes dangerous and sinister when he reflects the greed of the bathhouse employees back at them, while Yubaba's seemingly venal persecution of Chihiro and Haku is offset by her concern for her child and her aimless feuding with her sister. Visually and musically, Spirited Away is every bit the equal of Miyazaki's earlier films, with even the use of computer animation – often a problematic area for Japanese animated films – seamlessly integrated. Yubaba's immense multi-levelled bathhouse is among the most richly realized animated locations ever created, its chaotic bustle brimming with visual treats to revisit; yet Miyazaki resists the temptation to crowd the movie with animated trickery, generously using silence and space to let the film breathe. The final journey undertaken by Chihiro, as she takes a wordless, melancholic train ride to visit Yubaba's sister and rescue those she cares about, is among the most beautiful sequences I've ever seen in an animated movie. 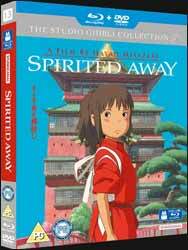 There's little point in trying to sell the film further: if you've seen Spirited Away before it's all too likely you've been bowled over by the creativity, imagination and depth of storytelling on display, if not this superbly made dual-format release is recommended without reservation.